This 28cm saute pan is perfect for many dishes where extra volume is required such as chicken basque or a meat bolognaise. With our PFOA free 5 star ProCook Ultra double layer non-stick coating you can be assured of perfect cooking results every time. What's more it benefits from a toughened, heat resistant glass lid to seal in juices and flavours so your ingredients will stay fresh while cooking. This Gourmet Stainless Steel cookware is built to offer incredible strength and versatility at amazingly low prices. Made from highest quality 18/10 stainless steel the pans have a 4mm encapsulated base for even heat distribution and perfect cooking results. For strength each pan benefits from riveted, silicone stay-cool handles. 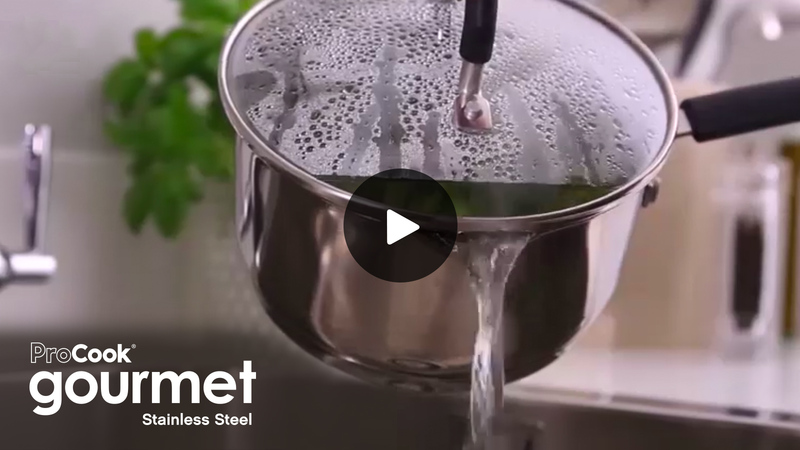 The Gourmet Stainless Steel range is suitable for all hob types including induction and is oven safe up to 260C meaning you can transfer from hob to oven, or keep ingredients warm in the oven after cooking. Washing up is a doddle as the whole range is dishwasher safe. The two insulated handle are a great bonus. Use this pan all the time.